CAPE CANAVERAL — An experiment-carrying, reusable mini space shuttle operated by the U.S. Air Force will be boosted into Earth orbit Wednesday atop a United Launch Alliance Atlas 5 rocket. It will be the fourth flight of the military’s X-37B program, also known as Orbital Test Vehicle mission No. 4. The project is run inside the Pentagon at the Rapid Capabilities Office. Liftoff is scheduled for some time during a four-hour, unclassified period that extends from 10:45 a.m. to 2:45 p.m. EDT (1445-1845 GMT) from Complex 41 at Cape Canaveral Air Force Station in Florida. The actual target time will be announced on launch day. Officials held a successful Launch Readiness Review on Monday morning and gave approval for rollout of the rocket on Tuesday. The weather outlook calls for a 60 percent chance of favorable conditions. 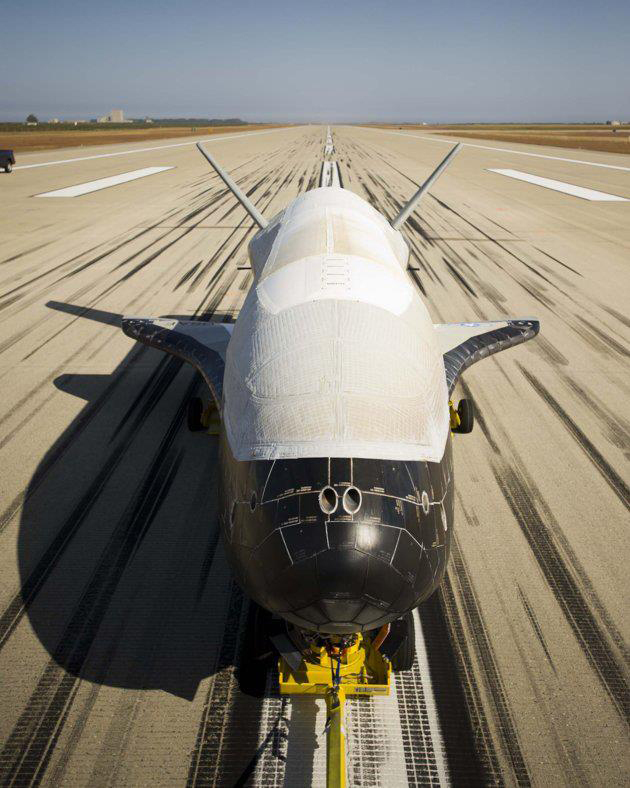 The three previous X-37B missions over the past five years have logged 1,368 days in space using a pair of spaceplanes that carried out their secret flights and then returned to Earth to make pinpoint touchdowns on autopilot at Vandenberg Air Force Base in California. Those three flights alone have eclipsed the NASA space shuttle cumulative duration of 1,334 days spent on 135 flights spread over 30 years. The Air Force said it has collaborated with several partners to test new investigations on this fourth X-37B flight. The mission will check out the performance of an experimental electric propulsion system jointly developed by the Air Force Research Laboratory and Space and Missile Systems Center. It is an in-space proof-testing of design modifications for Hall Current Thrusters currently used on the military’s Advanced Extremely High Frequency ultra-secure communications satellites. “A more efficient on-orbit thruster capability is huge. Less fuel burn lowers the cost to get up there, plus it enhances spacecraft operational flexibility, survivability and longevity,” said Maj. Gen. Tom Masiello, AFRL commander. The electric propulsion system produces a whisper-like thrust by ionizing and accelerating xenon gas. The fuel economy is a distinct advantage of such systems over conventional chemical rockets, keeping the weight down and enabling launch aboard a smaller, cheaper rocket. There’s also a NASA advanced materials investigation aboard the X-37B. Known as the Materials Exposure and Technology Innovation in Space, or METIS, the experiment will expose nearly 100 different materials samples to the space environment. METIS will fly a variety of quarter-sized samples of polymers, composites and coatings. “By exposing materials to space and returning the samples to Earth, we gain valuable data about how the materials hold up in the environment in which they will have to operate,” said Miria Finckenor, the principal investigator for METIS at NASA’s Marshall Space Flight Center in Huntsville, Alabama. METIS is building upon data obtained during several missions of the Materials on International Space Station Experiment (MISSE), which exposed more than 4,000 samples in space in suitcase-like packages from 2001 to 2013. One-quarter the size of NASA’s now-retired space shuttles, the robotic X-37B conducts its mission and then autonomously returns to Earth, braking from orbit, plunging through the atmosphere and gliding to a landing on a conventional runway to be refurbished and reused. 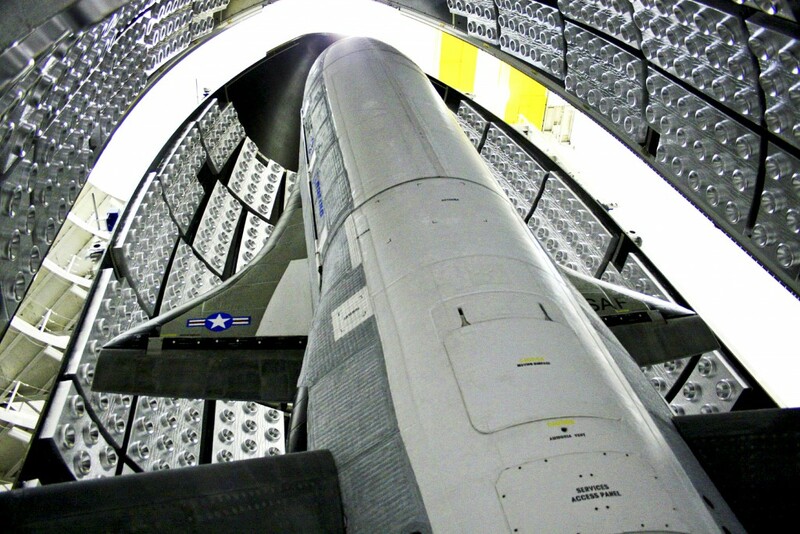 X-37B features a pickup truck-size cargo bay, seven feet long and four feet wide. The craft’s unique capability to drop from orbit and land on a runway allows technicians to get their hands on the hardware after being in space. Built by Boeing’s Phantom Works division, the spaceplane is 29 feet long with a wing span of 15 feet, made of light-weight composite structures instead of aluminum. The craft is shielded with high-temperature wing leading-edge tiles made of toughened uni-piece fibrous refractory oxidation-resistant ceramic, or TUFROC, instead of reinforced carbon-carbon panels used on NASA shuttles. It also has a next-generation shuttle silica tile that’s more durable and toughened with uni-piece fibrous insulation, and is the first space vehicle to use advanced conformal reusable insulation (CRI) blankets. There are no hydraulics aboard the X-37B as flight controls and brakes use electromechanical actuation. And unlike the space shuttles that used cryogenic liquid hydrogen and liquid oxygen reactants to generate electricity through onboard fuel cells, limiting the mission lengths by the amount of consumables that could be carried, the OTV is powered by a deployable solar array. The longest shuttle flight was 18 days. The spaceplane can weigh up to 11,000 pounds fueled for launch. This latest mission comes amid work to convert two former shuttle hangars at Kennedy Space Center over the X-37B post-flight refurbishment halls. 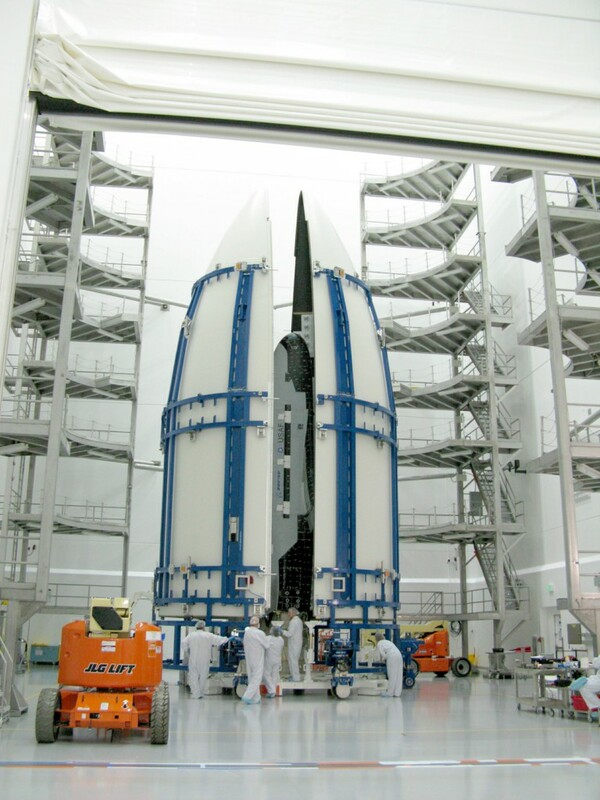 The Air Force won’t say if OTV 4 was readied for flight at KSC. 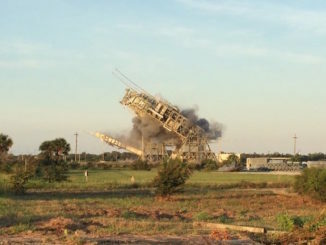 “OTV is leveraging previous space shuttle investments and the OPF facilities to conduct recovery and refurbishment activities at a single location,” said Capt. Chris Hoyler, an Air Force spokesperson. The X-37B is shrouded inside the voluminous, 18-foot-diameter nose cone of the Atlas 5 rocket, which shields it during atmospheric ascent. The Atlas 5 is flying in its 501 configuration, a two-stage rocket with a five-meter payload fairing, no strap-on boosters and a single-engine Centaur upper stage. It is the 225th flight for the high-performance Centaur, which has launched spacecraft to every planet in the solar system, plus the moon and Pluto. Centaur stands 42 feet tall and weighs just 5,000 pounds, the pressure-stabilized, 0.20-inch thick stainless steel walled balloon tanks hold 46,000 pounds of cryogenic liquid hydrogen and liquid oxygen fuel. Three minutes and 45 seconds into the launch, the Atlas 5’s fairing will be jettisoned and expose the craft to space. Staging occurs at four-and-a-half minutes and the Centaur upper stage executes a 13-minute burn to heave the OTV spaceplane into low-Earth orbit. 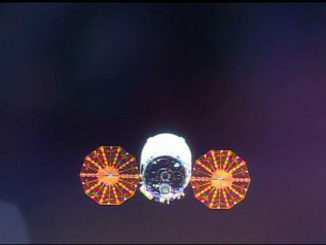 Deployment of the vehicle comes just shy of 19 minutes after liftoff. 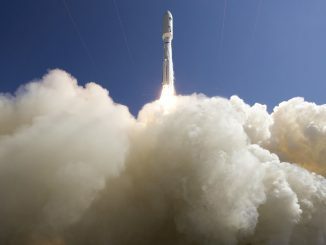 It will be the 54th Atlas 5 launch since 2002, the third this year and the program’s sixth use of the 501-configuration. For ULA, this is its 96th mission overall since 2006, the 46th Atlas 5 to fly under the company’s banner and fifth combined Atlas and Delta flight of the year.